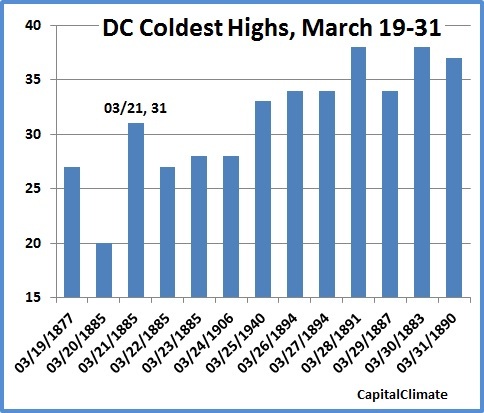 Denizens of the DMV were complaining about the early-spring cold this March 21, but the chill was nowhere near the historical extremes for this date or any other date through the end of the month. Although the high for the day of 42° was set shortly after midnight, the daytime temperatures were mostly in the 30s. On the other hand, the afternoon high did reach 41°. This was well below the historical average of 58° in Washington, DC, but it was also a full 10° above the coldest high temperature for the date, which was set in 1885. In fact, it would not be near any coldest high for the remainder of March. The CapitalClimate chart from National Weather Service data shows that all but 1 of the 13 record coldest high temperatures from March 19-31 were set over 100 years ago. The one exception was 73 years ago, on 03/25/1940.